MIDDLETOWN — The gymnasium at Middletown High School felt like a sold out hip-hop concert on Monday evening. Crowds from both teams were screaming until their lungs couldn’t take it anymore. There wasn’t an empty seat in a Division I matchup that pitted two undefeated teams. With the game tied at 73 with twenty-one seconds left, Middletown head coach Jim Kelly subbed in Noriel Brown to defend standout Kingston guard Brian Moore. Middletown had the final possession of the quarter. Brown was brought in just in case Moore got a last-second offensive opportunity. Middletown guard Marquis Gill dribbled near half-court until six seconds remained in the game. He passed the ball to Keon Gill in the corner, who pump-faked and drove to the lane for an acrobatic reverse layup that missed by about two feet. Brown caught the errant layup, and banked it in just as the clock expired. The game-winner gave Middletown (4-0) a 75-73 win over Kingston (6-1). Kingston trailed 20-6 after the first quarter, and trailed by as many as 20 points in the second quarter. 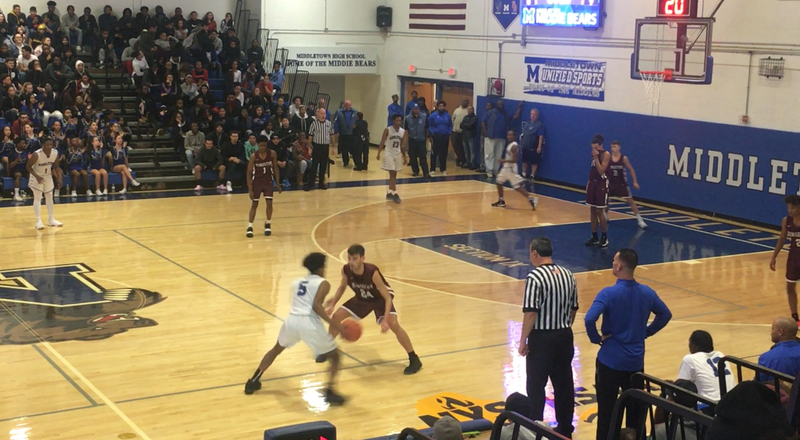 The Tigers struggled against Middletown’s full-court press, making several bad passes, which resulted in layups for the Middies. After trailing by 20 early in the second quarter, Kingston head coach Ron Kelder called a timeout. He passionately pleaded with his players to move their feet on defense, and take smarter shots on offense. Soon after, Brian Moore scored 16 of Kingston’s 24 second quarter points, bringing the Tigers to within a point. Middletown ended the half on a 7-0 run, giving them a 38-30 halftime lead. Middletown led by 13 points at the end of the third quarter, but Kingston came back to cut the deficit to three with less than a minute left. Kingston sophomore guard Shy’Quan Royal blocked a layup, and got an and-one off an offensive rebound to tie the game at 73 with twenty-one seconds left. For Noriel Brown and the Middletown team — the rest is history. In one of the best games in his career, Brian Moore led both teams with 39 points. Marquis and Keon Gill led the Middies in scoring once again with 27 & 21 points respectively.